Junior forward Joyner Holmes tied her career high with 22 points as the Longhorns cruised to a 91-73 road win at Kansas (photo by Jose Mendez / Horns Illustrated). LAWRENCE, Kansas — Junior forward Joyner Holmes tied her career high with 22 points, and added six rebounds and three assists, to lead the No. 14 Texas women’s basketball team to a 91-73 road win over the Kansas Jayhawks at Allen Fieldhouse. The victory improved the Longhorns’ record this season to 19-5 overall, and 9-3 against Big 12 teams. Kansas fell to 12-10 overall, and 2-9 against Big 12 opponents. The game was effectively over early. The Longhorns hit 33 of 52 of their field goals, rode a 15-0 scoring run in the first half to take a comfortable 43-26 halftime lead and never looked back. The 63.5 field goal percentage was the eighth-best in UT women’s basketball history, and the best since Feb. 20, 2013. 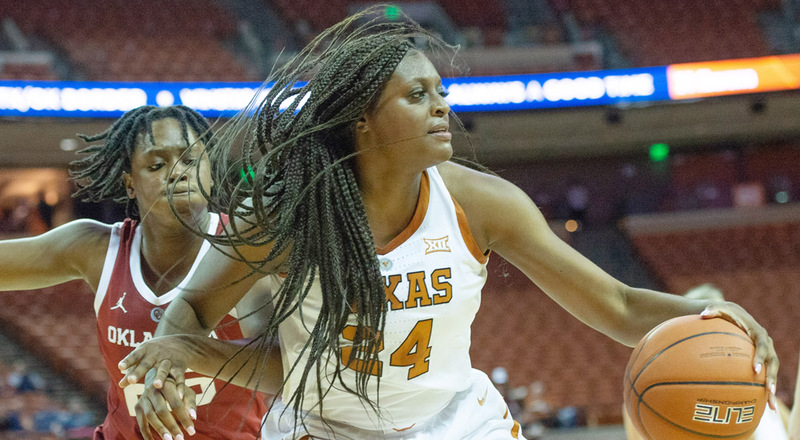 Holmes was one of five Longhorns who scored in double figures. Charli Collier and Danni Williams scored 14 points apiece, Sug Sutton had 12 and Olamide Aborowa added 10. Much of Collier’s scoring came from the free throw line, where she drained all 10 of her attempts, making her the second UT player this year to be perfect on 10 or more free throws; guard Destiny Littleton did the same Dec. 29 against Northwestern State. Texas dominated the glass, enjoying a 35-26 edge in rebounds, which helped lead to a 16-7 margin in fast-break points. UT also enjoyed a considerable advantage inside, thanks in large part to Holmes and post Jatarie White, who had seven points. Texas outscored KU in the paint, 46-30. Kylee Kopatich led Kansas with 18 points, while Aniya Thomas added 15 and Austin Richardson chipped in with 10. The Longhorns will stay north of the Red River for their next game, taking on Oklahoma State at 7 p.m. Tuesday in Stillwater, Okla., in a game that will be broadcast on Fox Sports Southwest Plus.